Sometimes it’s hard to let go of the ones we love . . . The day after her husband Kevin’s funeral, Kate Davis falls apart. She refuses to eat, shower, or sleep in her bedroom. She can’t remember large chunks of time from the last year. And she hears Kevin talking to her. As Kate attempts to stifle Kevin’s voice, she seeks help from a “spiritual” counselor, an exorcist, a psychiatrist, and group therapy. None of it works, and when she begins to uncover the truth about Kevin and their relationship, his voice turns from playful to accusing. No longer knowing who she can trust and believing God hates her, Kate wonders if she should give up on ever being “normal” again. Despite the unusual events, Kate’s situation is still one that every adult in a relationship can identify with. Love, unfortunately, always comes entwined with the fear of loss. Grove also paints a sad but accurate picture of the damage we cause when we deny the truth. Kate’s story will remind you that only God can put our broken parts back together. 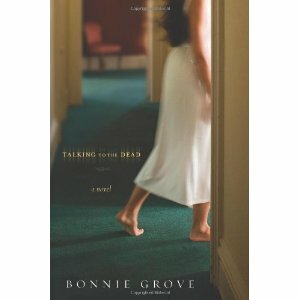 Between Grove’s eloquent use of language, touches of humor, and compelling plot, I didn’t want to put this book down. It deserved its win in the Contemporary Novel category of The Word Guild’s 2010 Canadian Christian Writing Awards. Her second novel, Time and Time Again, was due for release in September 2010. This review is an updated version of the one that originally appeared in Maranatha News in August 2009.